A couple of weeks ago I learned that my friend Judi Salzillo from 50 & Fabulous nominated Impression Evergreen for a Liebster Award. 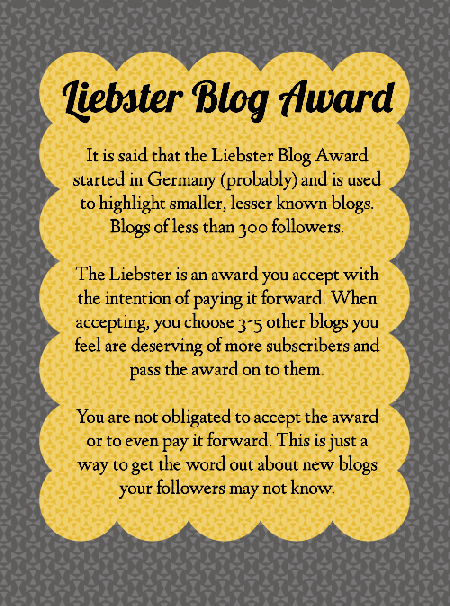 What's the Liebster Award you may ask? 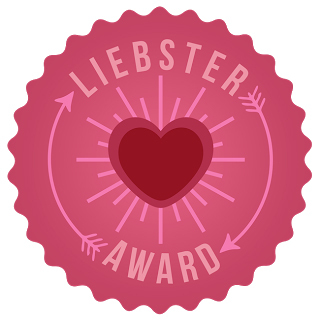 The Liebster is a form of special recognition that bloggers bestow upon their fellow bloggers. A way for us to share the work of our favorite independent publishers. The tradition appears to have originated in Germany and keeps plugging along like some kind of indestructible chain letter. If you choose to accept the award there are some tasks that must be completed to make it official. Here are the rules as Judi explained them to me. 1. Thank your Liebster Blog Award presenter on your blog and link back to the blogger who presented this award to you. 4. Copy and paste the award onto your blog. I like the concept so, despite the extra work, I've decided to play along. Plus, this will give me a chance to show my appreciation for the support I've received from some very talented individuals. My blog is a family project and I couldn't keep up without the help from my wife, Judy and the unique input from my field agents (children), Theo and Lukas. 50 & Fabulous - Judi is a fun-loving mom of three whose site details the ups and downs of daily life on the east coast. I'm not sure exactly how or when our paths crossed but she's been a loyal friend. Her posts are always entertaining and often humorous with topics ranging from cooking and gardening to baseball. She is also a very good photographer. 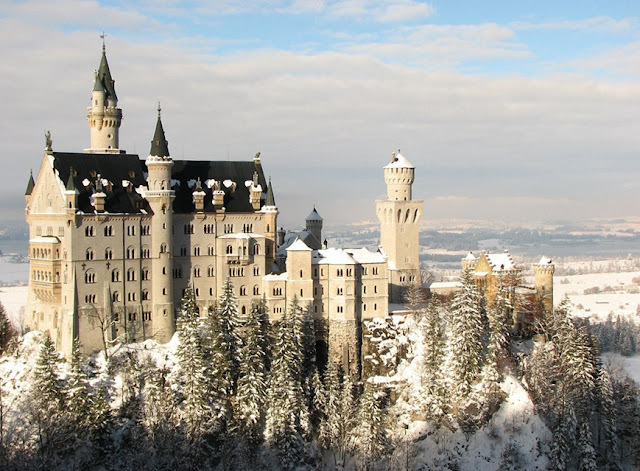 Thank you for the Liebster Judi, you can guest post on my site anytime. 1. What is the one food you can't do without? 2. One thing you want to do before you die? 3. What is your favorite hobby and why? Fantasy football with my son because it makes the NFL Games more fun to follow. 4. If you could travel anywhere in the world, where would you go? 5. What book are you reading now? The Pig and the Dragon. 6. What are you looking forward to most in the New Year? 7. Favorite meal when eating out? 8. If you have one 'do-over', what would it be? I have no regrets - don't look back. 9. What is your favorite movie and why? Lord of the Rings because of the jagged mountains and beautiful horses. 10. Who is your favorite TV character? 11. If you had a day to do anything you wanted to do, what would you do? Mountain climbing in the Sneffels range near Ouray, Colorado. 11. I've been married for 23 years. CASLworks - Stefan, Carlos and Francine are awesome! On their site you'll find art, photography, poetry, writing and you can even get your horoscope. They are true Renaissance People. Their string of posts about the benefits of blogging is what inspired me to start my own online journal. I'm very grateful for their unending support and encouragement. Zen For Zoey - Zoey writes original articles about entertainment and the movies. She crafts monumental posts that are validated with incredible research and her own personal experiences. She's also a really good photographer. Zoey is one of the nicest people I know and has been very supportive of my work. Thanks, Zoey. Pre-Columbian Americas - Zoe is an excellent writer that is an expert on the history of pre-contact MesoAmerica. Her work is well researched and extremely intelligent (she's way smarter than me). Through her historical fiction novels she tells a fascinating story about the rise of the Aztec Empire. Please check out her stunning site. Watercolors by Luisa - Luisa is a fantastic artist who works in transparent watercolor, something that is very difficult to master. Believe me, I know. It's amazing how she captures the air and light of the California mountains in her paintings. Her site features these beautiful jewels of art. colorsandpastels - Claudine is a pastel artist based in Luxembourg. She's one of my favorites and a great friend. Pastel is another medium that's very unforgiving so I really respect her talent. I don't always understand the language written on her site but the images speak for themselves. Her oceanscapes are magnificent. Susan's Headspace - Susan's blog documents her wonderful encounters with nature. She observes the birds and wildlife of her region in intimate detail. I frequently cross paths with Susan on twitter as she is a prolific tweeter. Thanks for all of the retweets. Susan is also an excellent photographer. Hundred Book Pile-up - Cindy is a retired teacher and a superb writer who reviews children's books on her site. You'll also discover posts about her garden, quilts and writing. She is a self-published author and I loved reading her middle grade fantasy book The Pig and the Dragon. 2. What is your astrological sign? 4. Who is your favorite artist? 5. What is your favorite bird? 7. What is the one thing that you absolutely could not live without? 8. If your life was a motion picture, what would the title be? 9. What's something you've never done but have always wanted to do? Love it!! Nice job Dan - I like shopping too and I don't like scary movies!!! And gotta have chocolate - I am going to check out the other blogs on your list as well, they sound very interesting!! We tried to have fun with this post. I also wanted to make sure I recognized some of the other people who have been very supportive of my work. Each of those sites is very good so I definitely recommend that you check them out. They're all very talented and will provide lots of inspiration. Thanks again, I really appreciate it. Thank you so much for including me on your list of nominations. I'm truly honored by such high praise. I endeavor to write film posts that are entertaining and informative, but the icing on the cake is when caring friends such as yourself, respond in such enthusiastic and supportive ways. Thank you again, and I look forward to our conversations on Twitter. Your welcome, I really enjoy reading your articles because they are entertaining and informative. Hopefully people who see this post will take the time to explore your site because it's worth it. I really believe in each of the blogs listed not only because of the great content but because of the genuinely nice people that publish them. Thanks for your support and I will see you on Twitter. Thank you for including me on your list of nominations. I am very honored by this. I checked your post out. Thank you very much, I appreciate your kind words. It's always nice to receive support from fellow artists, it kind of helps keep you going. I try and always have something on the drawing board so hopefully I'll get some new stuff finished. Excellent web site you have got here.. It's difficult to find excellent writing like yours nowadays. I honestly appreciate individuals like you! Take care!! Thanks for the nice comments, I will check your site out.